I've loaded the car with guitars, gear, clothes—after figuring out what to take and what to leave behind on our cross-country, “Island to Island” tour. We started out from the island of Alameda and will eventually reach our eastern-most island destination of Martha’s Vineyard. Soon after that, we will be playing at the Tidewater Friends of Folk concert series in Virginia Beach—the gig that started this whole thing. After playing at First Street Café in Benicia this Saturday, my friend and brilliant accompaniest Peter Andrews and I headed out -- and we will return on October 4th. We will be driving nearly 10,000 miles, crammed into a Toyota Prius. Our first stop was in Sacramento—for brunch to celebrate my mother’s and sister’s birthdays. That’s where Peter and I both grew up and played in a teen rock band together. After brunch, we headed up to a gig in Reno on Sunday night. September has always been my favorite month. Somehow the sky seems bluer, and the air seems lighter. It is the time when baseball games mean something. The sun is just a little bit lower and the daylight is softer and warmer, as if reaching from a campfire. Even though the calendar doesn’t think so, it has always been a month of beginnings for me. As a kid, there was the start of a new school year—which was exciting for the first week or so. I first went to the Sisters Folk Festival in September 2005 and going up to Sisters every year has marked the beginning of my “music” year. And now, the road trip. That’s it for this month. Hope to see you soon! PRE-VIEW OF OCTOBER 28TH THURSDAY, 7-9pm SHOW AT THE COFFEE GALLERY IN ALTADENA, CA. Here’s the write-up from their website: There’s magic when Steve Meckfessel and Chris Kokesh come together. Steve is one of those under-the-radar songwriters that when you discover him you think, ‘Lucky me!’ Steve’s music is often compared to that of James Taylor, Jackson Browne and Cat Stevens. Chris toured for ten years with the iconic Misty River band. Her first solo CD, ‘October Valentine’, is turning hearts and heads and is currently No. 20 nationwide on the Folk DJ charts. 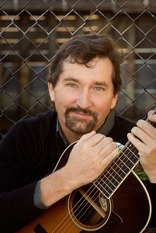 Special guest Peter Andrews is a guitarist/composer with a long list of film, TV and recording credits. Don’t miss them!